This is a very simple bird feeder, very easy for kids to make again and again. Take a long piece of yarn, tie a large knot in one end, then string on Cheerios. When the string is almost full, tie another knot in the other end. Wet your hands and squeeze the strand of Cheerios, getting them damp, but not soggy. Hold the strand over your kitchen sink and sprinkle it with a layer of cayenne pepper. The red pepper is supposed to deter squirrels, but is harmless for the birds. 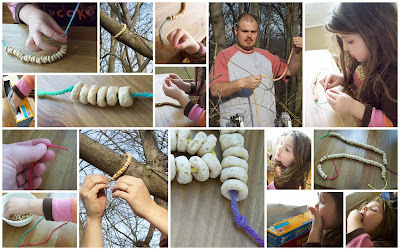 Take the strand of Cheerios outside and wrap it around a tree branch you can see from your window. Tie the two knots and any excess string together, making a snug little "bracelet" for the branch. We have the same oversized legos. I haven't put them away yet because Christopher (5) still loves playing with them and I love the creative things he builds!